I love the above photo - the delicate china teacup, the glass teapot, the three-tiered cake stand, and the almost cartoon-like bright blue sky. It all feels a bit Alice in Wonderland, doesn't it? 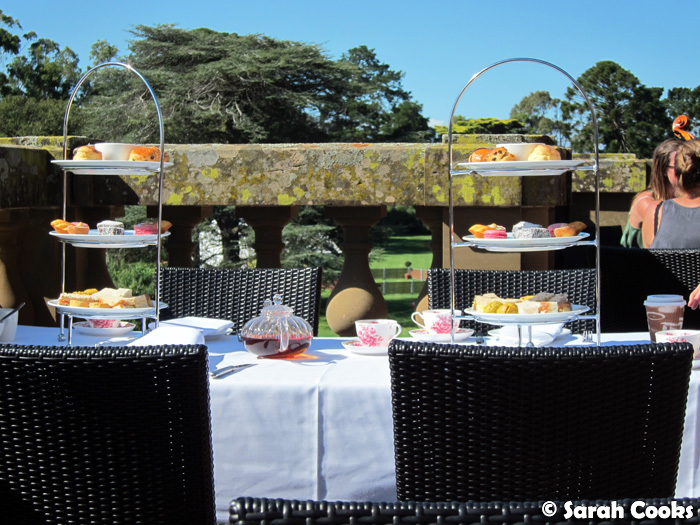 This was at the Vintage High Tea event at Werribee Mansion and Park, which I was invited to attend as part of the Melbourne Food and Wine Festival. I actually received the invitation while I was in Penang, in the midst of visiting all those wonderful historical sites, including the Cheong Fatt Tze mansion - I was super excited about the opportunity to see another historic mansion on the Lonely Planet top 10 list! 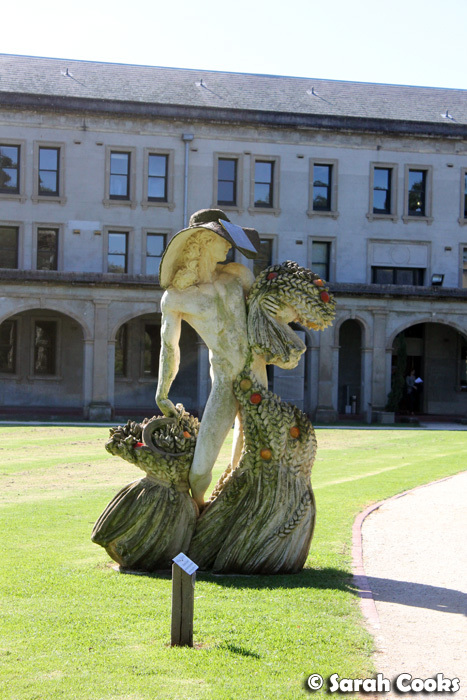 The invitation included an overnight stay at The Mansion Hotel, located behind the Mansion itself, in a separate wing originally built by the Catholic Church as a seminary. 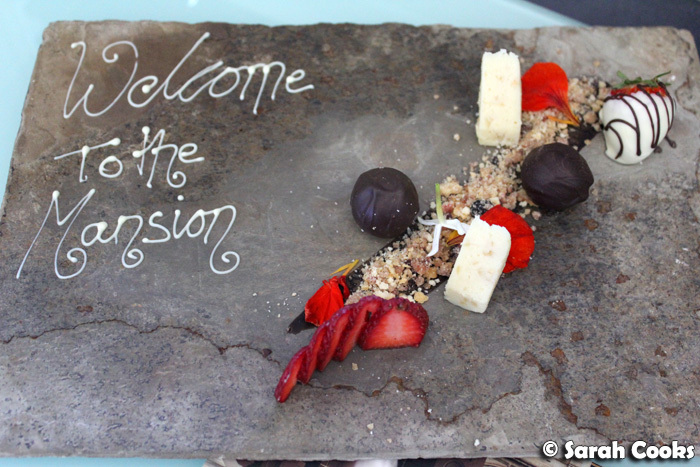 We arrived on the Saturday afternoon, to be greeted by this lovely chocolate platter in our room. Far from its austere origins, the room was compact but very comfortable, complete with modern furnishings and luxurious bedding and pillows. The clever architects managed to fit a whole (comfortable!) 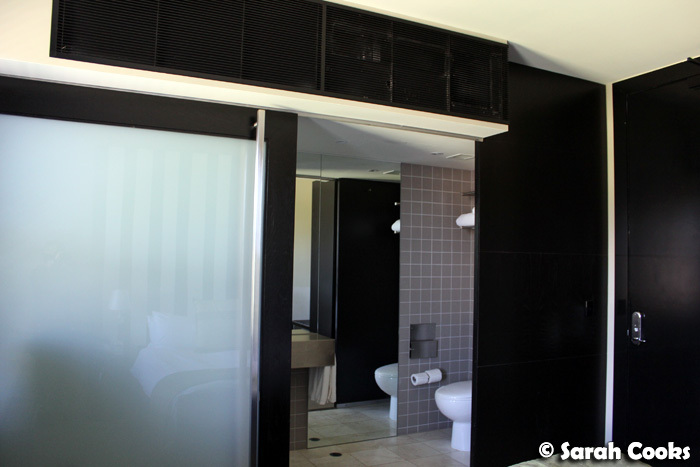 bathroom, in what essentially looked like a large cupboard from the outside. Very nice! 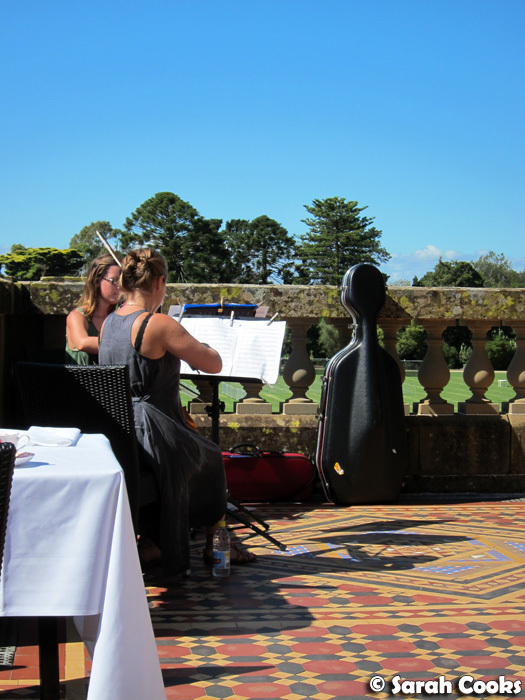 I met Patty from Q Strategies and Michelle in the lobby, and we made our way through the Mansion to the balcony, where we were greeted with glasses of sparkling wine and the strains of classical music from a string duo. 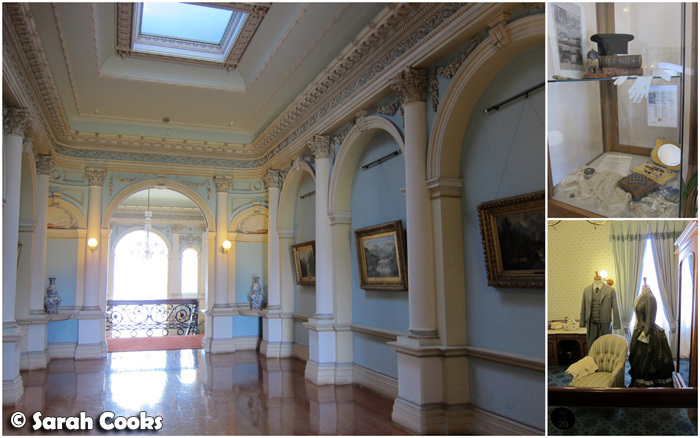 From the description on the event website, I had expected it to be a stand-up affair, with canapes and sweet treats being served in various rooms of the Mansion. "Enjoy sparkling wine and cucumber sandwiches amongst the beautiful manicured gardens, perhaps even a game of croquet or badminton. 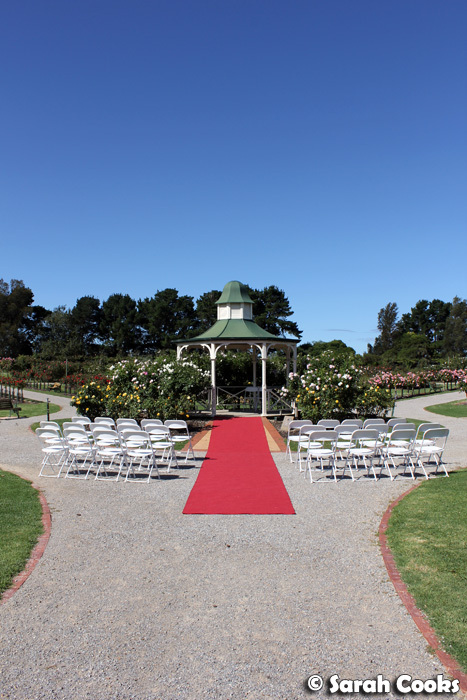 Wander through to the magnificent historic Mansion where you can sip tea and graze on delectable treats in the lavish dining room, ball room and private sitting areas." 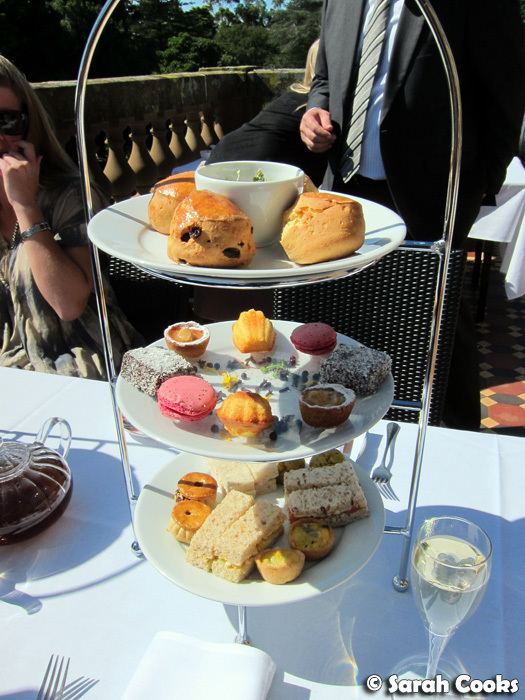 However, it turned out to be an altogether more sedate experience, with guests sitting down on the balcony to enjoy traditional afternoon tea treats. We were lucky to have beautiful clear blue skies, and the hotel even provided umbrellas for those who wanted to shade themselves from the strong sun. 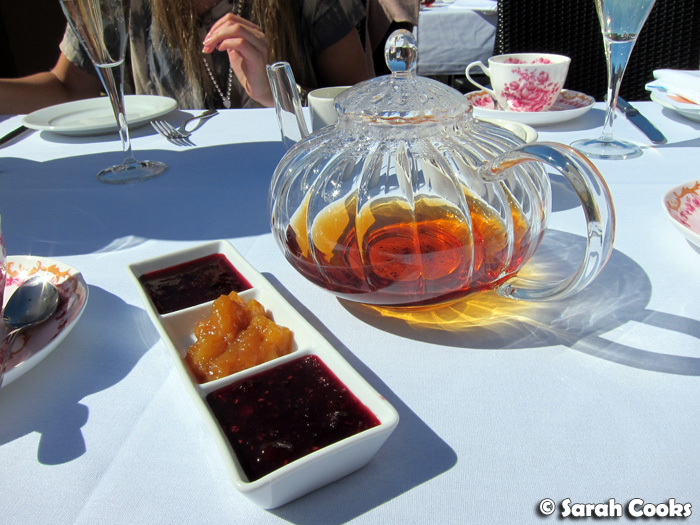 We drank T2 Melbourne Breakfast tea - one of my favourites! 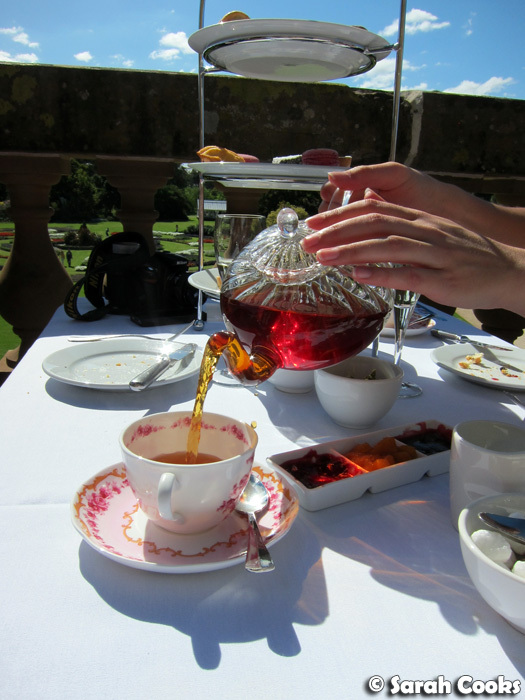 - in pretty china teacups, poured from lovely clear teapots. 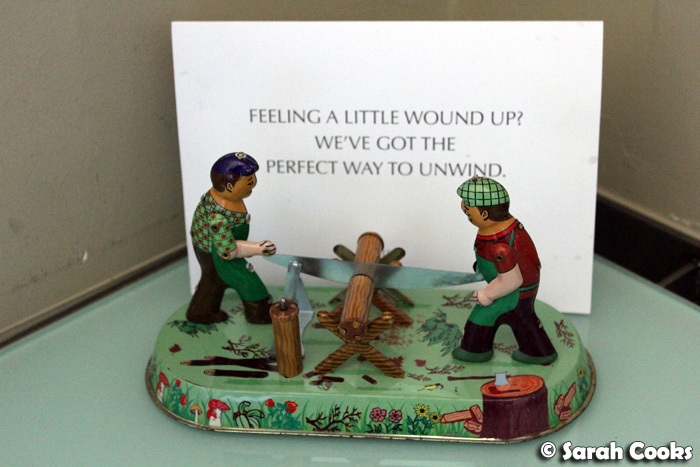 I worked strategically, starting with savouries and working my way up the cake stand. 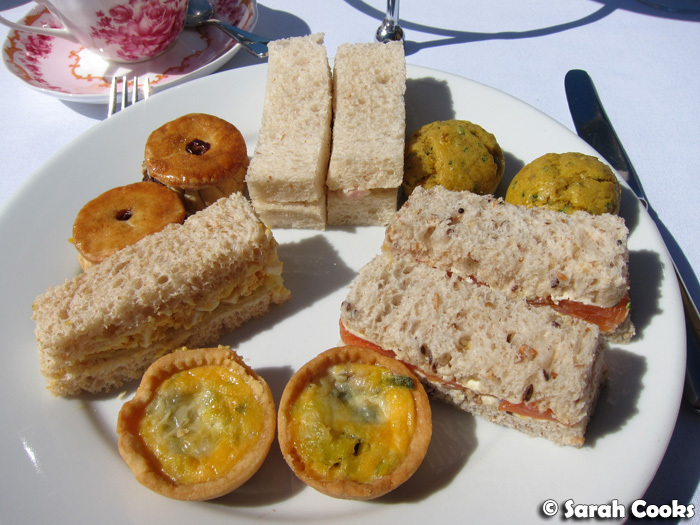 On the savoury plate were three kinds of sandwiches: smoked salmon, egg, and chicken. (There were two of each sandwich; I ate one before I took this picture!) Whilst all the fillings were great, the bread had unfortunately dried out a little. (I wonder if bread stales faster in the heat?) The warm offerings were mini quiches, chive muffins, and miniature beef pies. Like the hilarious Miranda, I don't ordinarily like savoury muffins, but these were actually delicious - very moist, and with a nice flavour from the chives. The mini beef pies were high quality but bought in - the same ones are served by the corporate catering at my old work, and I've had them before at the Kaffeehaus Vienna pop-up cafe in the NGV. The items on the second plate were all fabulous. 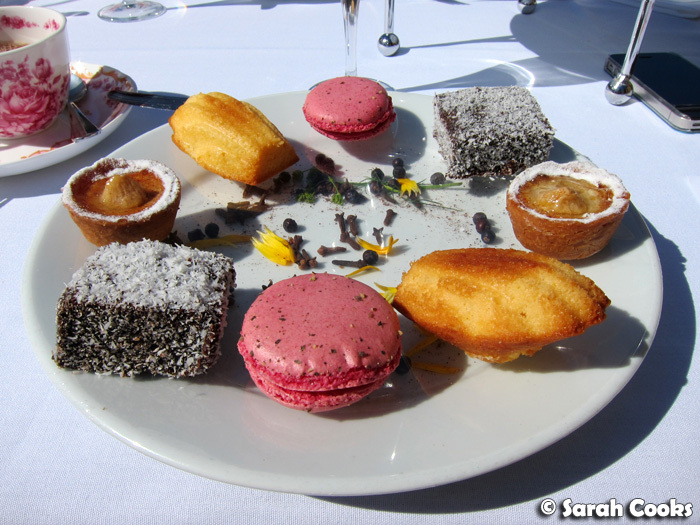 There were light lemony madeleines, moist apple frangipane tartlets, pink macarons generously filled with soft buttercream, and the most delicious lamingtons, made with pieces of chocolate sponge cake, dipped in ganache and dessicated coconut. 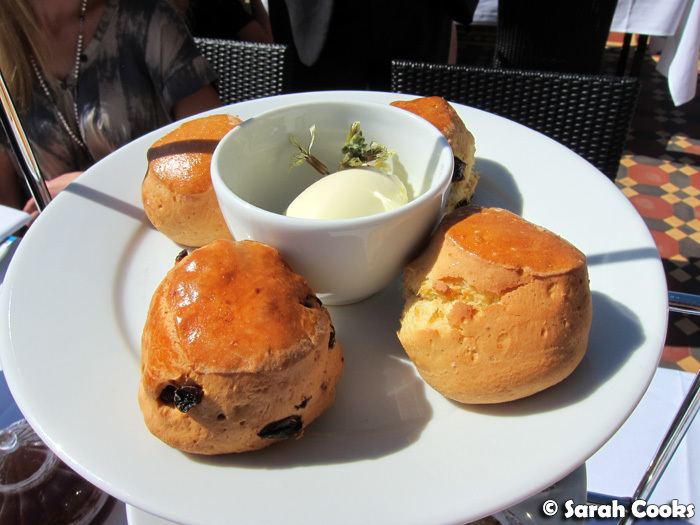 Each cake stand had both plain and sultana scones, as well as a quenelle of gorgeously thick clotted cream. Jam wasn't provided on the table, but was brought out quickly when requested. 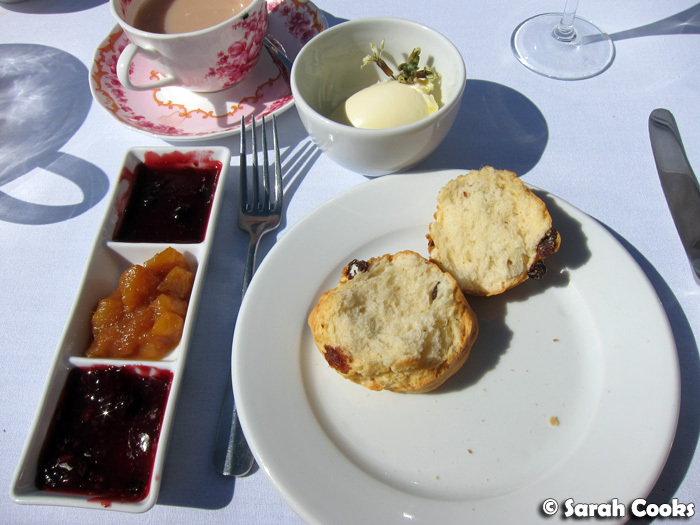 The scones were so good! They were crusty on the outside with soft, fluffy middles. I slathered mine thickly with cream and raspberry jam - wonderful! 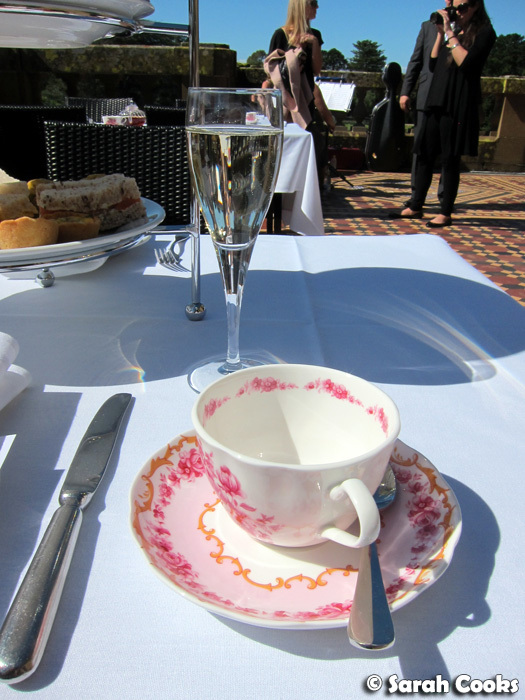 Although this event was a once-off for the MFWF, I've been told that The Mansion is planning to launch a recurring high tea soon. I'm not sure of exact dates, inclusions or prices - check their website for up-to-date info - but to give an indication of price, this event was priced at $90 per person, with each three-tiered cake stand being shared by two people. 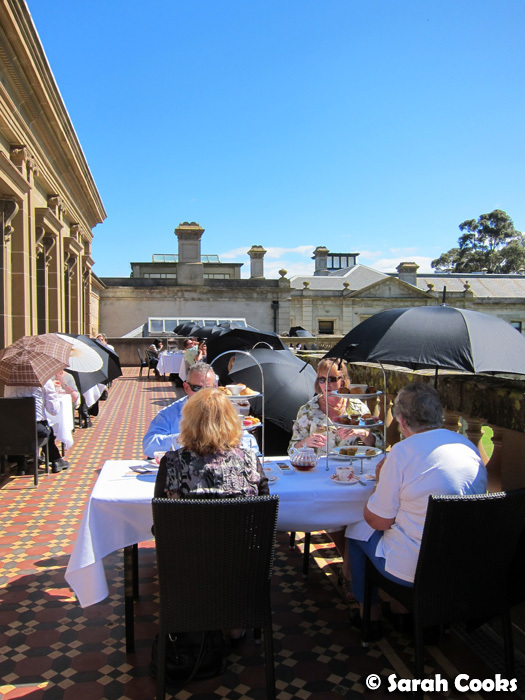 The afternoon tea finished a bit earlier than expected, which gave us time to enjoy the beautiful grounds in the sunshine. We had a quick stroll through the mansion itself - visiting the Cheong Fatt Tze mansion in Penang has awakened my interest in history - and I loved seeing the exhibitions of old clothing, historical artefacts and the recreated bedrooms and living rooms, giving an indication of what life was like back in the 1800's. The view from my hotel room was the back side of this statue! 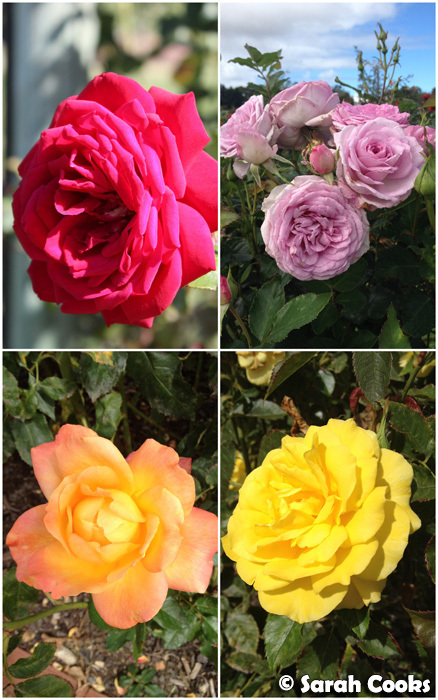 I particularly enjoyed the Rose Garden, with over five thousand roses and the most incredible frangrance. 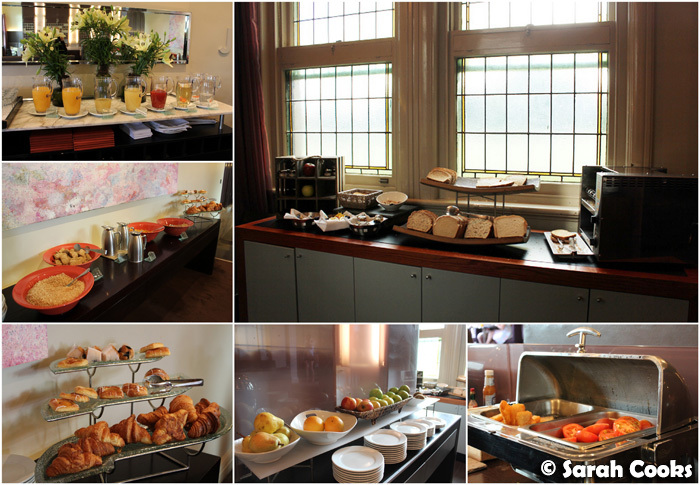 The next morning, we went downstairs for a buffet breakfast - on offer were juices, toast, cereals, pastries, fruit, and hot breakfast items. As you can see, I went for a big savoury breakfast: the hash brown (again, bought in but high quality) was particularly impressive, very crispy. 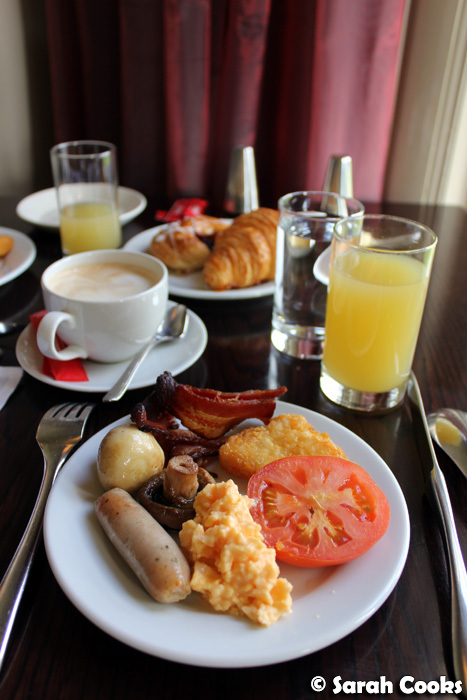 You'll see I didn't have any toast - smart girls avoid bread at buffets! 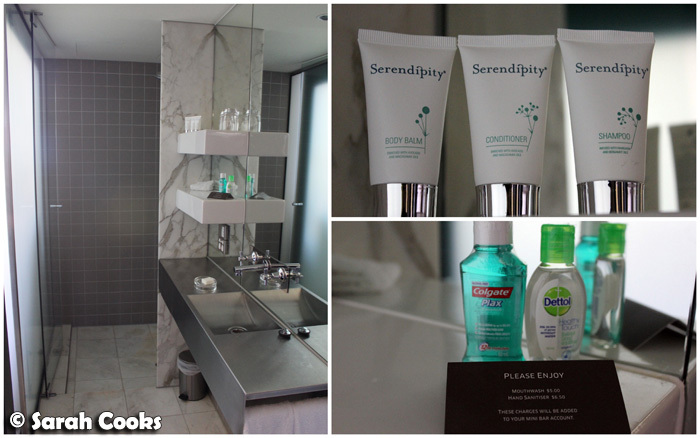 And as if that weren't enough indulgence for the weekend, a Lazy Pedal package was also included in our stay. 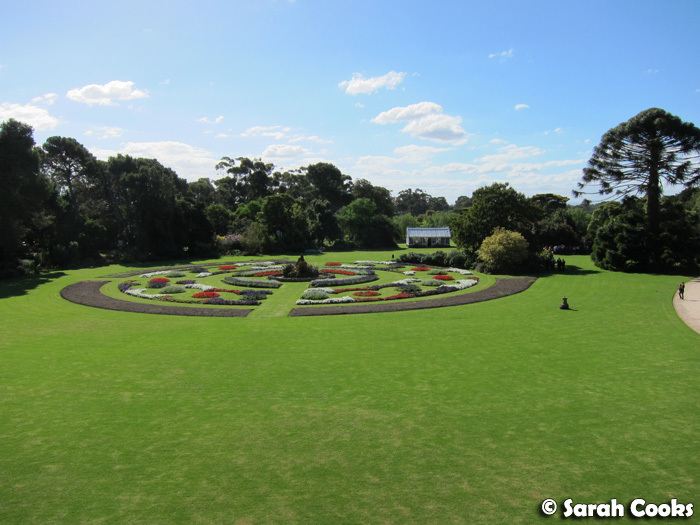 As part of this package, guests are given a picnic hamper and the use of bicycles to explore the gardens of Werribee Park. 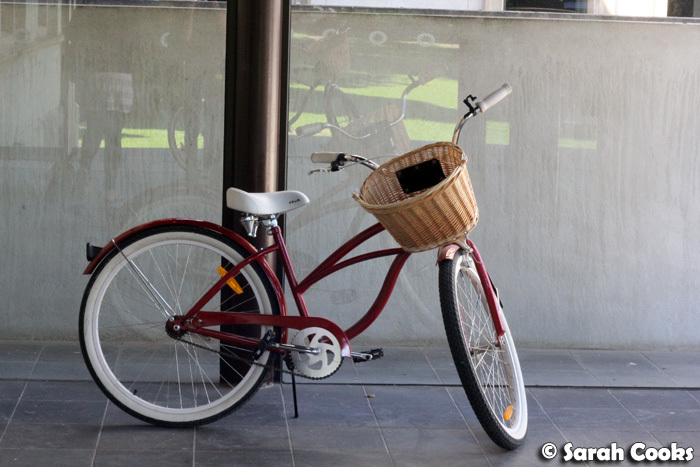 I can't actually ride a bike (embarrassing! 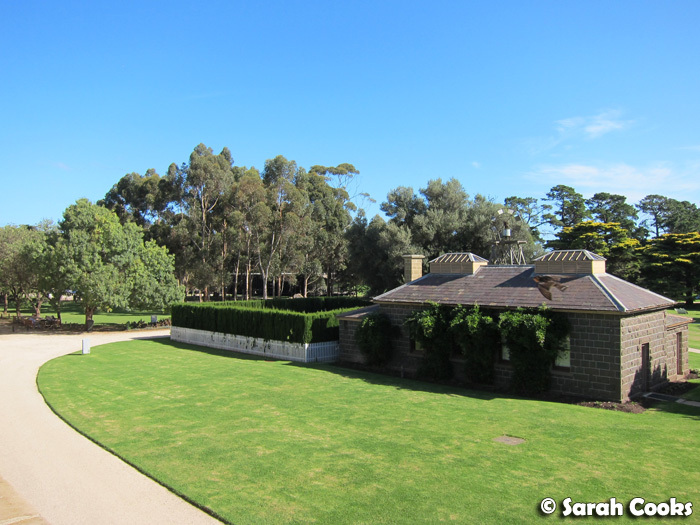 ), so we just walked with our picnic hamper and found a nice spot on the lawn behind the hotel. 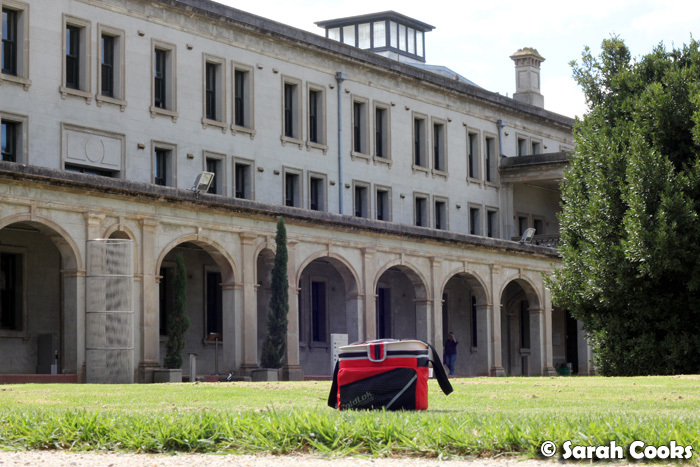 The picnic hamper itself was a red insulated bag, and whilst it was perfectly serviceable and practical, I must say it looked a bit incongruous against the beautiful historic buildings! 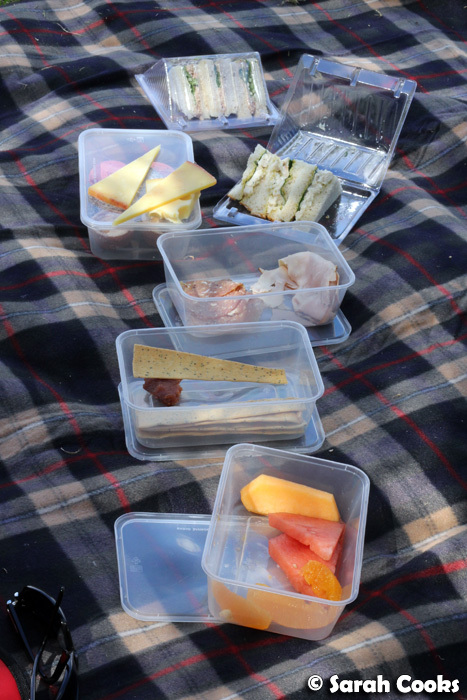 Inside our picnic hamper were sandwiches (chicken with curried avocado, and tuna), some salami and ham, cheeses, lavosh and quince paste. For sweets, there were cut up pieces of fresh fruit, as well as some of the same petits fours that were served at the afternoon tea. Again, a little menu card would have been great. For some reason, there weren't any cutlery or napkins in the hamper - this made it a bit tricky to eat the cheese and quince paste! 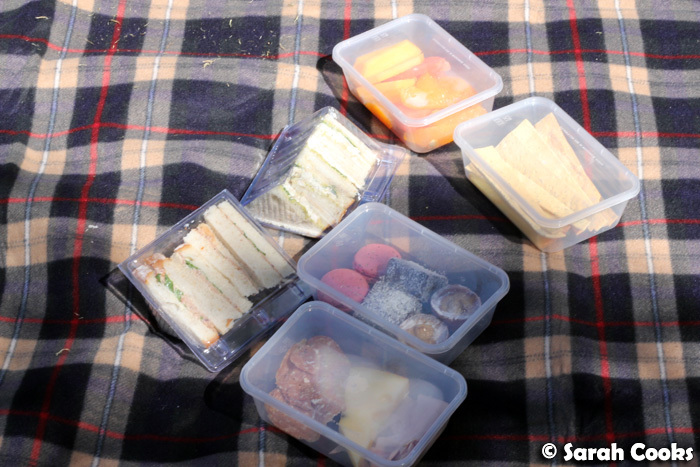 When we picked up the hamper from reception, we were told that everything was included, so hadn't thought to ask for anything extra, and by the time we'd found our picnic spot and set ourselves up, it was too much effort to go all the way back to reception. Oh well! We also hadn't been told that drinks weren't included, which was a bit of a shame - I would have been happy to purchase a bottle of wine or sparkling water at the bar next to reception if I'd been made aware of this! 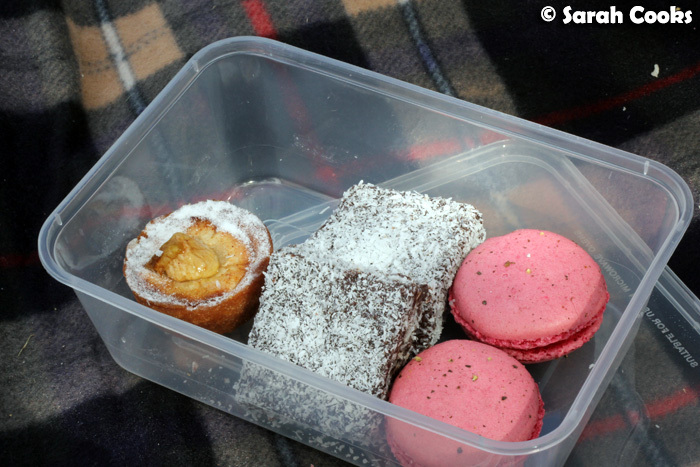 On a more positive note, I was so glad that the delicious frangipane tarts, chocolate lamingtons and macarons were included in the picnic! 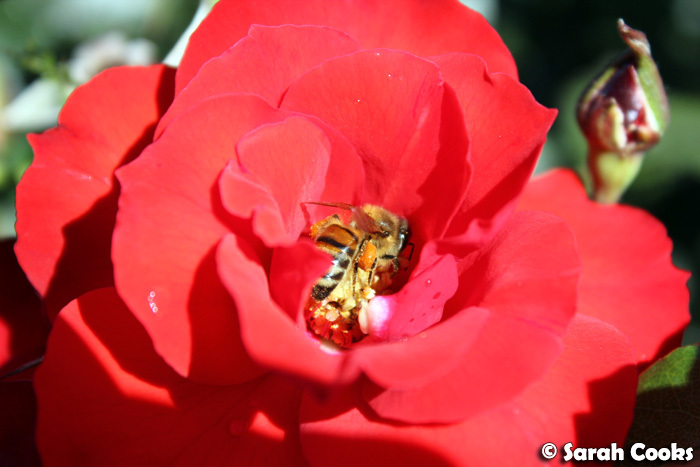 We took some photos of the insides, so you can see how yummy they were! 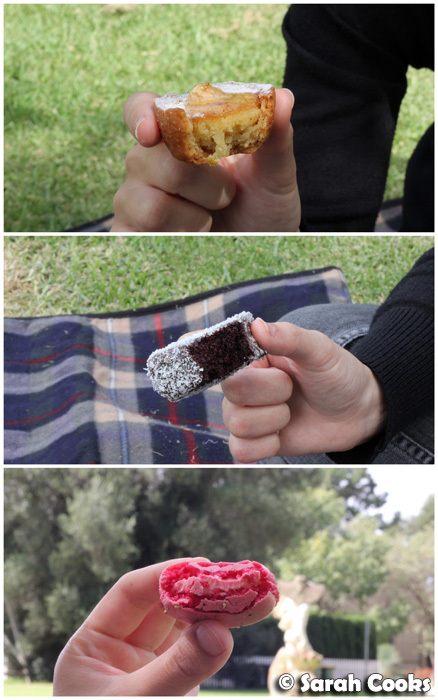 I loved the short, crumbly pastry on the apple frangipane tart, and the ganache-coated moist chocolate lamington was a deluxe version of what can often be a dry disappointment! The macaron, whilst having a rather prominent flowery flavour (I'm pretty sure it was musk), had a fantastic texture: the shells were very lightly crisp on the outside and soft within, and the buttercream was smooth and creamy. You can see Michelle's fab write-up of the weekend here. 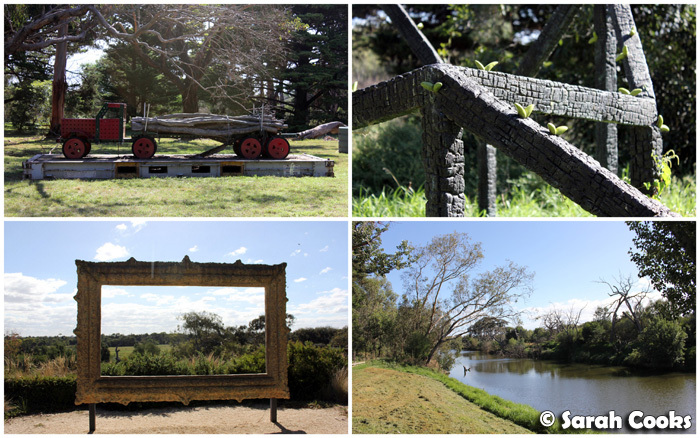 Thanks to Patty from Q Strategies for organising a fun and indulgent weekend! 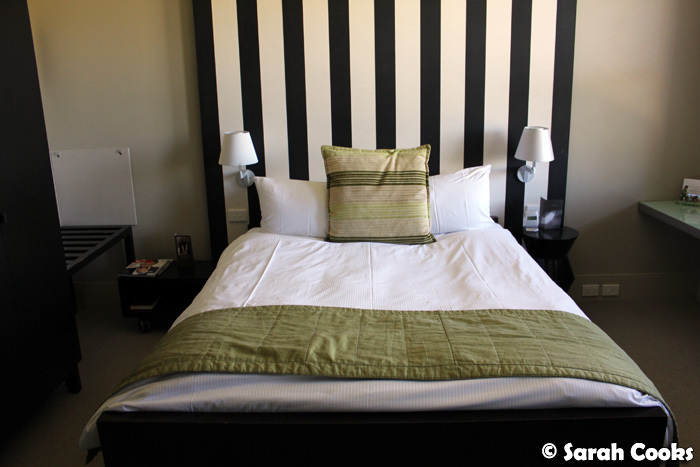 Sarah and Sandra stayed at The Mansion Hotel & Spa at Werribee Park as guests of The Lancemore Group. 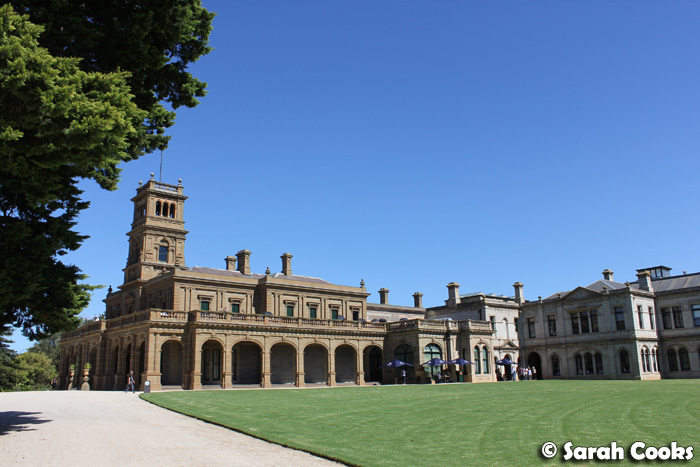 Ah Werribee Mansion - one of the ones that have been on my to-go list for as long as I can remember but still haven't actually gotten there!